James Neal is a Candian professional ice hockey player who currents play for National Hockey League for the Calgary Flames as a winger. Besides playing for Calgary Flames, he has also played for Dallas Stars, Pittsburgh Penguins, Nashville Predators, and Vegas Golden Knights where he was also an alternate captain for Vegas Golden Knights and occasionally leads the side. The thirty-one years old currently has an estimated net worth over $20 million. As per personal life, he is in an open relationship with his long-time girlfriend. As of 2019, Jame Neal has an estimated net worth over $20 million. Currently, the hunk is under the 5 years $28,750,000 contract with the Calgary Flames, including $28,750,000 guaranteed, and an annual average salary of $5,750,000. Moreover, In 2018-19, he will earn a base salary of $5,750,000, while carrying a cap hit of $5,750,000. 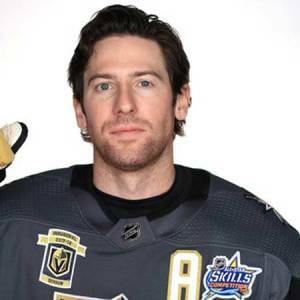 A successful and popular ice hockey player, James Neal has earned a massive amount of wealth from professional ice hockey. He previously had a two-year contract that earned him $ 2.25 million in the first year that rose to $ 3.5 million the following year with Dallas Stars. Neal also signed a contract for 5 years worth $30 million with the annual salary of $ 5 million with the Pittsburg Penguins in 2012. As per our record, Neal has managed to earn about $41,366,829 in his 12 years NHL career. Currently 31, James Neal stands at a height of 6 feet 2 inches tall and weighs around 100 kg. Talking about his personal life, it was reported that he is currently in a relationship with his girlfriend, Melanie Collins. Melanie Collins is an American television personality by profession and famously known for being a host for a golf channel. It was also reported the pair began dating since 2014. By looking at their social networking sites, the couple seems to be enjoying a happy and loving life. They enjoyed being with each other and they look like a fine couple. Both the pair have stayed out themselves from troubles, affairs, and scandals, as there is no rumors or controversy surrounding them. Currently, they are enjoying a happy and blissful life with no signs of splitting up. They have not announced officially if they are going to take their relationship to the next level. James Neal born to mother, Deborah Neal, and father, Peter Neal in Whitby, Ontario Canada on September 3, 1987. He holds a Canadian nationality. Besides him, there are three brothers in his family James, Nick, and Peter. He was initially trained by his father in developing hockey skills. His brother, James plays in NHL for Nashville Predators. He also has a sister named Rebecca. His favorite team during his childhood was the Maple Leafs. During his early teenage life, he played for ice hockey teams such as Plymouth Whalers as well as Bowmanville Eagles. He made his professional playing career debut with NHL team, Dallas Stars in 2007 and after playing a couple of seasons with Dallas Stars, he later went to play for Pittsburgh Penguins and Nashville Predators. Neal was picked as part of the draft with the Vegas Golden Knights in 2017. He has also represented Canadian national ice hockey team and lead his team to secure Gold medals at the World Junior Championship and silver medal in IIHF World Championship.